HOLLY SPRINGS, Miss. 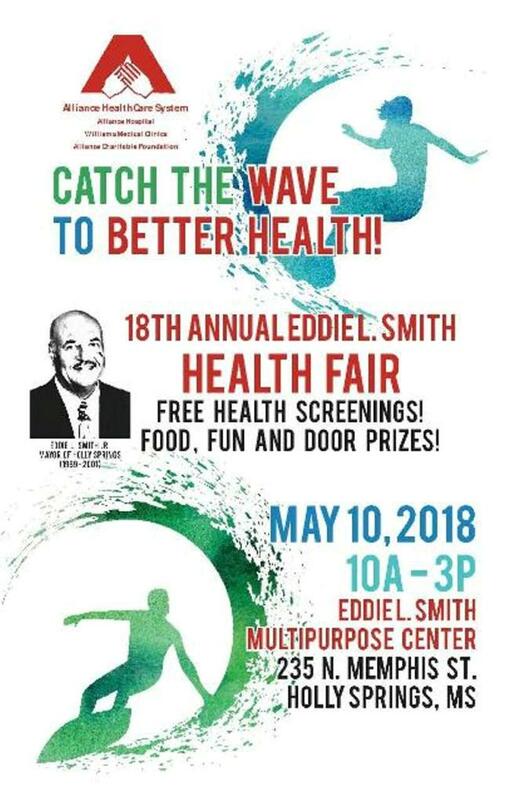 - April 6, 2018 - PRLog -- Alliance HealthCare System is hosting its 18th Annual Eddie L. Smith Health Fair in Holly Springs, Mississippi on Thursday, May 10, 2018 at 10:00 a.m. The goal of the health fair is to provide medical care and education to foster health promotion and prevention awareness in an effort to improve overall health and wellness. The health fair will be held at the Eddie L. Smith Multipurpose Building located at 235 N. Memphis Street in Holly Springs and will include free HIV testing, youth dental exams, massages, tips on healthy living, health screenings including, blood pressure, glucose, body mass index, vision, and spine, elderly care services, fun activities, food, giveaways and much more. "Continuing our theme of 'where your health matters,' we at Alliance HealthCare System and Williams Medical Clinic are proud to produce this annual event at no cost to our community," said Dr. Kenneth Williams, President of Alliance HealthCare System. The health fair is free and open to the public. The event is sponsored by Alliance HealthCare System (Alliance Hospital, Williams Medical Clinic, Alliance Hospice, & Alliance Charitable Foundation). This endeavor is just one of many that the Alliance HealthCare System is embarking upon to enhance the quality of life for Marshall and Benton County residents. The annual health fair is named in honor of the late Eddie L. Smith who was the first African-American Mayor of Holly Springs, Mississippi. Alliance Healthcare System (AHS) is a premier provider of emergency medicine and preventive care through two outpatient clinics, hospice care center, and an acute care hospital. AHS provides a range of quality healthcare services and strives to promote health and well-being for the people of our community. The AHS hospital is a level 4 trauma center that provides 24 hour emergency care to the residents of Marshall County.